For April I was inspired by fabulous closets. Guess who did not post any fabulous closets, offered no closet organizing advice and did not touch her own closet? What can I say? The Real World comes first. So, I've decided to keep the party going another month. 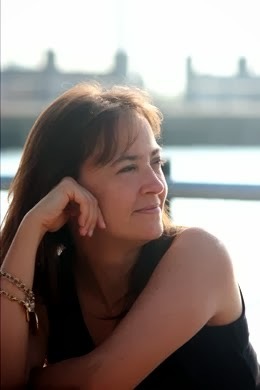 But in the meantime, I wanted to share some of the fabulous things you've been doing. Spring seems to have given everybody some DIY energy (or maybe all the rain kept us inside and made some of us get things done.) You people amaze me. Nicole at Design Blooms revealed her fabulous sun room makeover. I want to live in this sun room. Just check out those fish pillows up top. Casey at Loft & Cottage revealed her cozy guest room makeover. Don't you want those mirrors? 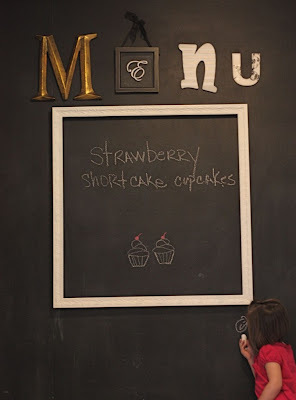 Jesse at Good Girl Gone Glad finished a fun chalk board wall. It looks like it's already being put to use. 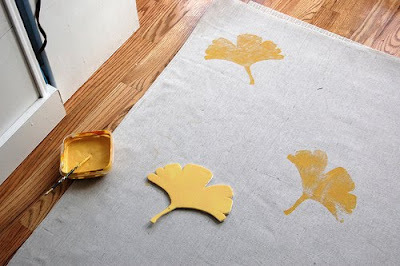 McLaura at Ramblings around DC and Beyond made this gorgeous hand-stamped ginko leaf rug. Hand. Stamped. Maya at Soccer Mom Style shared this awesome DIY book clutch. You know I'm a sucker for a good book clutch, especially one that doesn't hurt a book. 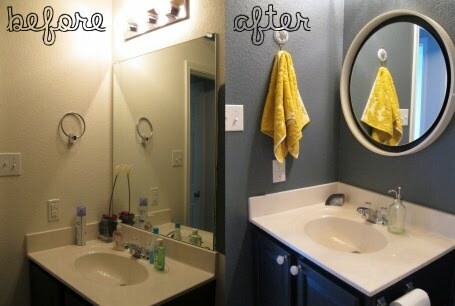 Elissa at What the Vita shared her bathroom makeover featuring my favorite color - grey. Got something going on? Or seen something that inspired you? Link up for April . . . and May. so many goodies here! 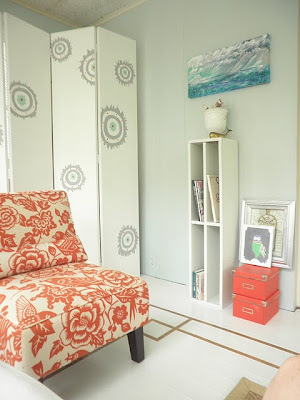 That rug is insane and I adore that sun roon. 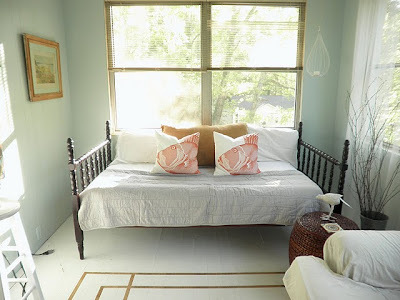 That sun room makes me want to take a langorous daytime nap. Me and my guy have been trying to do some DIY decor in our Boerum Hill apartment, but these pics make our attempts look pretty amateur! Anyway - great site! I want that rug. But I don't want to make it. Because I am lazy.